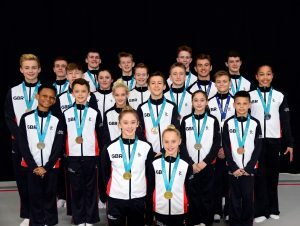 Spelthorne Gymnasts started their record making World Championships before they even began competing by having the largest amount of partnerships selected for the Great British World Championships Team of any club in the country. With twenty-one gymnasts securing their place on the team for the 2018 Acrobatic Gymnastics World Championships in Antwerp Belgium (the “City of Diamonds”) there was hope that the Spelthorne gymnasts would shine, and that they did. Spelthorne Gymnasts were competing in four different age categories – ’11-16’, 12-18’, ’13-19’ and senior (15+). In the 11-16 age group, Spelthorne had three strong partnership contenders to reach the finals and battle for medals. All three reached the finals with ease. Starting with the men’s four of local Spelthorne residents where Bradley Gold, Jack Clegg, Jake Turner and Harry Watson who pulled out of the bag a routine that far outreached their qualification performance to achieve a score of 27.30 to improve by 1.6 marks, this comfortably gave them the Bronze Medal and within reaching distance of the Russian winners, what a hope for the future. Qualifying in the tough and in-depth men’s pair category were Andrew Morris Hunt and Archie Collier. Any of the finalists could have stepped on the podium in what was an intense and fought for competition. The local lads held their nerves in check and produced a quality routine that gave them 27.25 and another Bronze medal for GB. After the qualifying rounds the women’s pair of Sasha Carpenter and Poppy Yates were in first place. However, with the scores going back to zero for the final, they would have to prove once again that their leading performance in qualifying could be repeated and if not bettered if they were to keep their prestigious spot on top. Having seen their compatriots medal, the pressure was on. They performed with their game faces on and stunned the crowd and judges with a performance stepping over all other competitors to reach the top of the podium and become World Champions scoring 28.45. Next up were the 12-18 age group gymnasts which again Spelthorne gymnasts had three partnerships representing the country. For all three there was no guarantees amongst a depth of world talent that any of them would make the finals. Sometimes achievement is not measured by medals by how much a partnership has learnt in a short amount of time. This was the case for the women’s group of Saskia Hobbs, Katie Blackford and Mollie Jaggers who having only trained for four months together before the championships didn’t make the finals despite a valiant and respectable effort, for them, making the GB team was proof of their ability, just the calendar was against them. The men’s group of Max Crawford, Jacob Robinson, Daniel Axford and Cameron Patrick Lothian played the balancing act between how difficult their routine was compared to how clean they could execute it. They achieved the perfect balance as they beat other contenders with more difficulty but who could not match them in execution. This recipe gave them the silver medal with a score of 27.34. Spelthorne’s 12-18 women’s pair qualified comfortably into the final but were up against fierce competition with all women’s pairs within a small margin of each other, they had to hold their nerve especially as they were drawn last to perform for a medal place. They executed a solid, clean and confident performance to score 28.1 to achieve the silver medal. The story for Spelthorne Gymnastics at these championships continued to unfold as it was the turn of the 13-19 age group men’s pair of Frazer Windows and Finlay Gray. Qualifying in the mix of the best of the World and a well-known pair on the World circuit, they still had to deliver the goods. A slight error in one of the balances left them not able to contend with the top podium place but was enough to stand amongst the best, achieving 27.50 and a bronze medal. The pinnacle of the sport and what every young gymnast should be aiming for is the Senior World Championships category and Spelthorne Gymnastics were represented here by Charlie Tate and Adam Upcott. A newly formed partnership who were part of the World Games Gold Medal winning men’s four from last year’s World Games. The men put themselves into the world of the unknown having only trained for a matter of months before they took on the World. Nobody knew just how their performances would match against what was the strongest men’s pair field ever in the Senior championships. In the game were the World men’s pairs champions from Germany, the World Cup winners from Russia and the home favourites from Belgium. Could the Spelthorne men face the battle ahead and hold their nerve against a crowd that would be routing for their own team? The boy’s confidence and outgoing character never faltered despite their inexperience as a pair. They surprised and shocked the World ahead of many more established teams to perform a routine that was close to faultiness in execution as others faltered and couldn’t take the heat of the kitchen. They achieved a score of 28.95 to secure the bronze medal at their first international showing. These results show that Spelthorne Gymnastics remains one of the most successful gymnastics clubs in Great Britain and one for which all of Spelthorne should be proud.